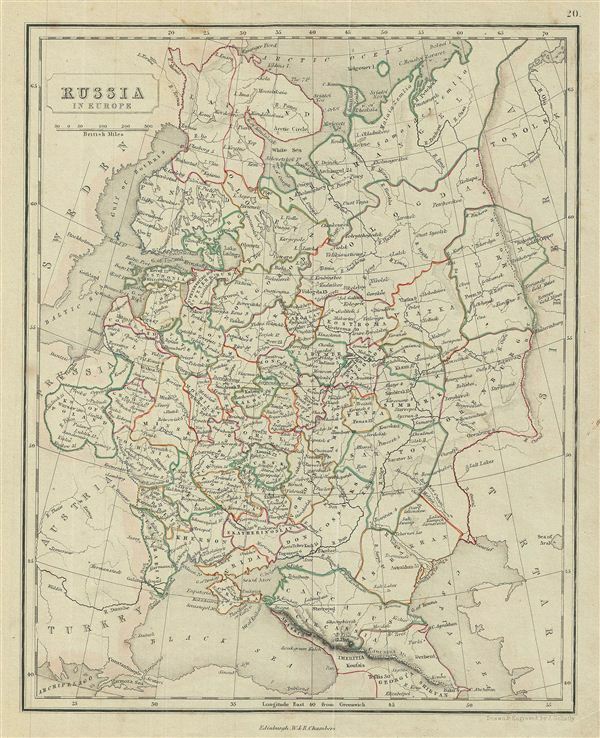 This is a fine example of the 1845 Chambers map of european Russia. The map covers from the Arctic Ocean to the Black Sea and from Sweden to Tartary. In 1825, a few years before this map was drawn, Russian army officers, called the Decembrists, protested against Nicholas I's ascension to the throne. The Decembrists, so named because their revolt started in December, favored Nicholas I's brother, Constantine, who seemed amenable to a British style constitutional monarchy. When Constantine abdicated the throne in 1825, the Decembrists refused to accept the more autocratic rule of Nicholas I. Had Constantine not abdicated and the Decembrists been successful, the bloody Bolshevik Revolution may never have occurred. Divided and color coded according to regions and territories, the map identifies various cities, towns, islands, rivers, and an assortment of additional topographical details. Map was engraved by J. Gellatly.